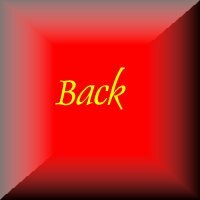 Books by Melvin M. Johnson Jr. Published first in 1941 was Melvin Johnson's first large scale book project. Written in conjunction with Charles Haven, who was one of Johnson's friends and member of the Johnson Automatics board of directors it is a well written and comprehensive title. It studied the development of automatic weapons from their earliest forms through the Henry Rifle and Colt revolvers to the invention of automatic pistols and machine guns. It went on to discuss accuracy, mechanical work to gain better accuracy, design and their deployment in the field. Has a pull out section in the rear showing schematics of different types of weapons and ammunition. Originally published by Morrow of NY for $5. Copy at right is the revised 2nd edition from 1942 (first run of that year). This is a fairly easy book to obtain with prices depending on quality and if there is a dust jacket with it. This book was revised as the war progressed and data was forthcoming on how automatic weaponry was being used in the field. The last revision was the 1943 edition. The book 'Rifles and Machine guns' was written in 1945 using a lot of material included in this book but the latter title was intended to augment this one. Charles Haven as well as being Co-writer on this book was also co-author of the classic book 'The History of Colt Revolvers' with Frank Belden. A small pocket sized paper backed book intended to be read by soldiers and probably bought at the PX bookstore or similar. 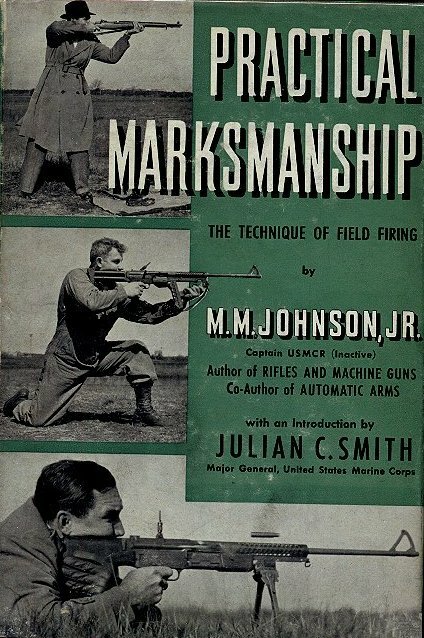 Written in 1943, Johnson says in the Forward "This is primarily a soldier's book. Those who find it useful will no doubt in some instances come in contact with one or more of the weapons described herein"
The book seems to be an abridged version of 'Automatic Arms' with all of the history and theory removed. It covers each category of weaponry and gives good descriptions and information on each weapon in that category. Field stripping and safety instructions are noted for each weapon as well. Published by The Infantry Journal in their 'Fighting Forces" series of pocket books it originally cost 25 cents, today expect to pay a little more!! Another collaboration between Melvin Johnson and Charles Haven. Published in 1943. 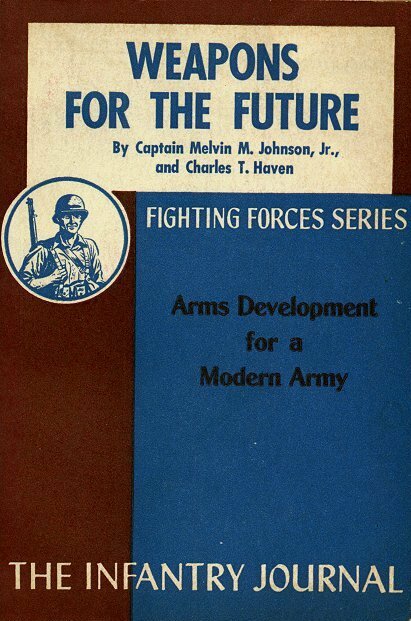 It is subtitled "Arms Development for a Modern Army" and "The Case for an American Arsenal of Peace"
Originally published in 1942 with the title "For Permanent Victory" this book is a departure from the others by these authors as it contains no diagrams or drawings of weapons but is more a propagandist case for having a strong military and the use by these forces of modern automatic weapons. It chronicles the development of military rifles in different armies and how the trend of the time was moving toward the use of highly mobile troops carrying automatic weapons that could bring down large amounts of highly accurate fire on an enemy. Published by the Infantry Journal, it is again one of the paper-backed "Fighting Forces" series of books. Original cost 25 cents. This title was written by Melvin Johnson in 1945 with a quite extensive forward by Major General Julian Smith USMC, Commanding General, Dept. of the Pacific (1945). General Smith had a career that included being Divisional Commander of the 2nd Marine Division at the Battle of Tarawa (1943). This book deals with the ways in which a firer can get the best results in both accuracy and rate of fire from bolt action and� automatic rifles, machine guns, revolvers and pistols plus semi-automatic shotguns in sporting scenarios. Chapters include Sights, Sighting-in, Holds and Positions, Aiming And Pointing, Firing,� Malfunctions and Stoppage Drills and Sniping. Has some interesting material and photos contained within it, most of which were taken at the rear of the Cranston factory. Published by Morrow of New York it originally cost $5, today it is a little difficult to come by and prices will be in the $35 to $40 range depending on quality and if there is a dust jacket etc. 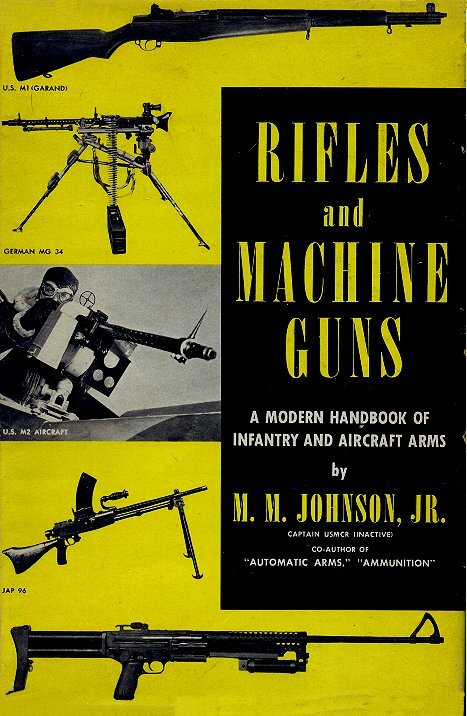 Rifles and Machine Guns - A Modern Handbook of Infantry and Aircraft Arms. 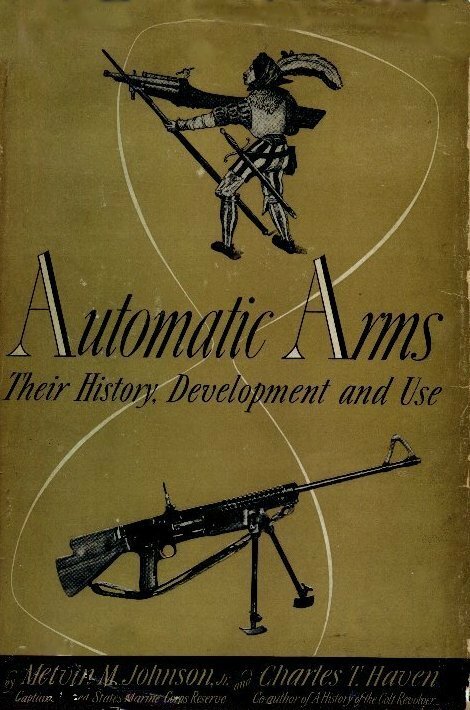 Written in 1945 as a companion to 'Automatic Arms' and 'Ammunition', this book contains the specifications of many of the automatics weapons used by the different nations during WW2. Chapters deal with each kind of weapon, automatic rifles, submachine guns, machine guns aircraft machine guns and automatic pistols. Detailed descriptions and field stripping note are included as well as photographs and line drawings of each weapon. Again published by Morrow of New York it originally cost $5, today this title would cost around $30 or more depending on quality and if there was a Dust Jacket present.